Once a score is added to a Harmonia page, users can navigate the Music Editor on the right side of the window by clicking anywhere inside the score’s blue lasso. 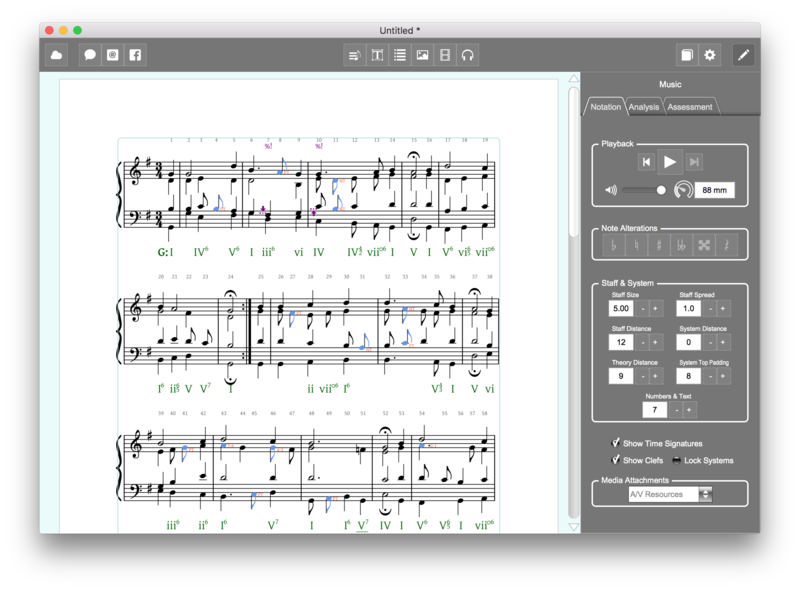 The Music Editor contains three tabbed sub-editors that allow you to interact with the musical score in a variety of ways. The notation editor contains three group of controls: a playback transport to play the score, a Note Alterations group to edits the score, and a Staff & System group to alter the appearance of the score. 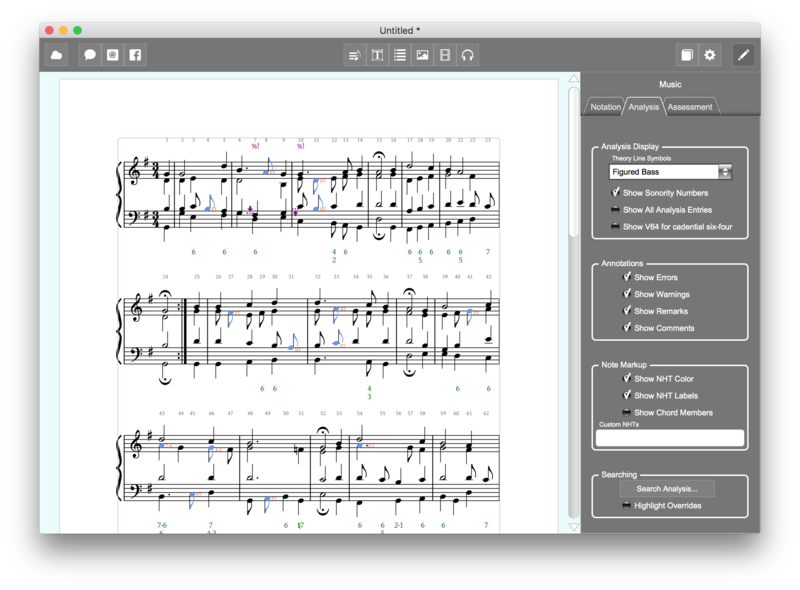 The Notation Editor provides controls to play, edit and change the layout of a musical score. Use the transport buttons to play, fast-forward and reverse, change the volume, and to alter the tempo. For the latter, either type in the desired tempo in the text box, or click and hold on the dial and drag your cursor in a vertical direction adjust the tempo incrementally. To edit a pitch on the score, click on it with your mouse and use the Note Alterations buttons to add an accidental or to turn the pitch into a rest. Alternatively, use keyboard shortcuts to raise and lower pitches: the plus sign (+) raises pitches by a semitone and the minus sign (-) lowers pitches by a semitone. Use these buttons to change the size and spread of the staff, and to alter the distance between and systems and score details. Once the desired layout has been reached, toggle the Lock Systems button to prevent additional changes. Depending on the context, it might be useful to hide or show time signatures or clefs. Toggle these buttons if desired. Use the pull-down menu to see and select imported A/V resources such as imported audio or video attachments. Though it is possible to view here which resources are attached to a given Harmonia document, all A/V resources are attached to text boxes, not music scores. Click on <attaching A/V resources> to learn more about attaching A/V resources. The analysis editor provides access to Harmonia’s powerful automatic analysis engine, markup editors, and in-app search engine. The Analysis Editor provides the ability to view the theory line in different ways and customize what annotations appear on the score. hide all theory line symbols. When Harmonia analyzes a score, it displays analytical information in a green line of text beneath each system of the score. Selecting None hides this analytical information. Roman numeral notation provides a concise and simple way to express both the scale degree and the quality of different chords. In a roman numeral, scale degrees are expressed as roman numbers (I to VII) for the seven diatonic degrees (tonic to leading-tone) with the additional feature that the roman number is capitalized if the chord is major or augmented and lower-case for minor or diminished chords. Harmonia displays common inversion symbols and can accommodate chromatic analytical symbols such as secondary or applied function chord labels (i.e., V7/V or viio6/iv), modal mixture and Neapolitan chords (i.e., bVI or bII6), and Italian, French, and German augmented sixth chords. Harmonic function analyses augment the aforementioned roman numeral analysis, adding a second-level harmonic functional analysis using the letters T, PD, and D, where T = Tonic, PD = predominant, and D = dominant. These analytical figures illustrate only local, phrase-level functions and are not yet editable. Harmonia analyzes chordal harmonies and determines the intervals above a given bass. Harmonia attaches accidentals rather than slashes to show chromatic alterations. Harmonia analyzes chords for root, quality and inversion. Harmonia analyzes chords for quality and inversion. Harmonia analyzes the notated distance between two harmonic intervals. These may be expressed as simple (one octave or smaller) or compound (more than one octave). Harmonia can analyze harmonic intervals notated on one or two staves. Harmonia analyzes monophonic, single-line notation for pitch, pitch class, or scale degree. Pitch refers to a musical sound in a particular register or octave. Pitches are labeled by a letter name (A-G), any accompanying accidental and octave designation (0-8), such as C#4 for the semitone above middle C.
Harmonia analyzes monophonic, single-line notation for pitch, pitch class, or scale degree. Pitch class represents all pitches sharing the same letter name or enharmonic equivalent, (i.e. all C’s are pitch classes, but the C found in the middle of the piano keyboard or between the staves of a grand staff is a specific pitch with a specific frequency.) Pitch classes are labeled by a letter name (A-G) and any accompanying accidental. Harmonia labels notated pitches by scale-degrees numbers. UP and DOWN arrows appearing before a scale-degree number indicate pitches that have been lowered from the original generated scale. Type a plus sign (+) or minus sign (-) before the scale-degree number to alter this in the theory line. Above each notated pitch or harmony is a sonority number, which Harmonia uses to keep track of notations. Determine whether these should be visible or not on the score by toggling the button. When Harmonia analyzes a score, it alerts users of potential errors and anomalies by marking the score with annotations. In the annotations menu, users can determine whether to display Harmonia's color-coded errors, warnings, remarks, or comments. Read about each annotation below. Comments are in color and include such... NOTE: Comments are note graded. The Note Markup group allows instructors to highlight non-harmonic tones (NHTs) and hide, show, or edit non-harmonic tone labels. Determine whether a non-harmonic tone should be colored blue to highlight it in the score. Determines whether the non-harmonic tone should be labeled or not. NHT labels are as follows: PT = passing, NT = neighbor, ET = escape tone, APP = appoggiatura, NHT = unclassified non-harmonic tones. Suspensions are labeled by the interval above the bass: 7-6, 4-3, 2-1, etc. Shows any root, third, fifth, and seventh of any given harmony on a score. All non-harmonic tone labels are editable. Want to use UN and LN rather than NT to specify upper and lower neighbor tones? Or, do you prefer "incomplete neighbor" to "escape tone"? In Harmonia, you can change the label name. Simply select the pitch on the score and then type the preferred label in this text box. The text box is site specific. We do not yet offer global settings for NHT labels. You can search any Harmonia-generated analysis for specific roman numerals, sonorities, or errors. Click the Search Analysis… button and open a pop-up widget with a pull-down menu. To search for a roman numeral, select it in the pull-down menu and then type in the desired roman numeral (with or without a specific inversion) to highlight it (in yellow) on the score. To search for a sonority, select it in the pull-down menu and then type in the desired sonority label. To find an error, select it from the pull-down menu and then select the specific error from the list in the secondary pull-down menu. Note: if you make any edits or changes to the theory line, you can locate these easily by toggling the Highlight Overrides button under the Search Analysis… button. Harmonia can convert any music score into a gradable assessment that a teacher can use as homework or practice exercises, drills, even timed exams and quizzes. See our documentation Converting Scores into Assessments for detailed instructions on how to create and configure a variety of assessments you can use in your classes.